The dreams of a feisty Moray child have come true after she took a dip in the water with a group of mermaids. Nearly £6,000 has been donated by well-wishers so that Forres youngster Eileidh Paterson can fulfil her “bucket list” goals. The five-year-old has been prevented from doing a range of activities due to the complex nature of her cancer. Eileidh wishes to experience as many things as possible which may appear “normal” for most children. These include playing on the beach, seeing real snow and having a bedroom makeover. And this week she ticked the first item off her list by taking a dip in a swimming pool for the first time in more than three years. But the day was made even more special when she was welcomed at the side of the water by three mermaids with colourful tails. Eileidh had to wear a special dry suit for the once-in-a-lifetime experience to prevent complications with her neuroblastoma cancer. However, the tenacious kid still managed to look stylish by wearing bright pink goggles to watch the mermaids under the surface. The youngster was gradually lowered into the pool as she kept her eyes fixed on her new-found friends. Once used to the pool the determined five-year-old mimicked the mythical creatures by flapping her legs while clutching a float. Eileidh’s family has been warned that any treatment for the youngster’s disease will not cure the cancer and can only prolong her life. This week her mother Gail was thrilled to see her daughter having fun as she was immersed in water for the first time since she was two-years-old. She said: “We were all amazed how quickly she took to it. I thought she may have been wary of going into the pool after such a long time – but in true Eileidh fashion, she nailed it. 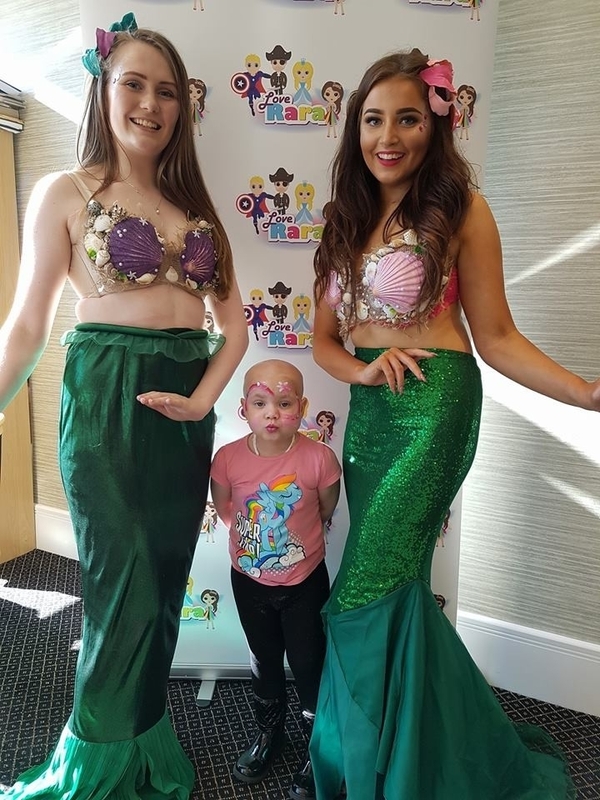 “She very quickly wanted figured out when to kick her legs and even wanted to go under the water like her sister Cerys and the mermaids were doing.